This years Shrewsbury Fields forever Festival takes place from Friday 14th to Sunday 16th September 2012 at the Shropshire County Showground and Features a weekend of the finest Live music, in the indie rock, punk, alternative and electronic live music scene including The Wombats, Ms Dynamite, Simon and Oscar from Ocean Colour Scene and Utah Saints. Some of the country’s freshest new talent will also be playing at the event, including Sunshine Underground, Herve, Danny Byrd, DJ Hazard, The Ratpack, Son, Mampi Swifty Wharton, Anne Savage Aziz, 12 Dirty Bullets, CoCo & the Butterfields, Professor Penguin, Lily Juniper, DJ Ed Mackie, Jay Robinson and more. British novelist, short story writer, poet, fighter pilot & screenwriter Roald Dahl was born 13 September 1916 in Llandaff, Cardiff, Wales. He was named after the polar explorer Roald Amundsen, who was a national hero in Norway at the time. Dahl first attended The Cathedral School, Llandaff. At the age of eight, he and four of his friends (one named Thwaites) got into serious trouble after putting a dead mouse in a jar of gobstoppers at the local sweet shop,which was owned by a “mean and loathsome” old woman called Mrs Pratchett. This was known amongst the five boys as the “Great Mouse Plot of 1924” Thereafter, he transferred to Saint Peter’s Boarding School in Weston-super-Mare, and in 1929, he attended Repton School in Derbyshire, During his school years He was never seen as a particularly talented writer , although He excelled at sports, and was made captain of the school fives and squash teams, and also played football. As well as having a passion for literature, he also developed an interest in photography and often carried a camera with him. During his years at Repton, Cadbury’s, would occasionally send boxes of new chocolates to the school to be tested by the pupils. 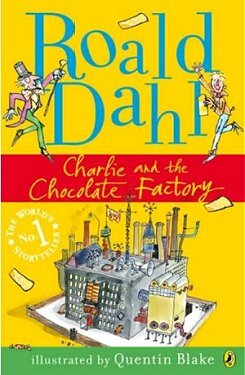 Dahl apparently used to dream of inventing a new chocolate bar that would win the praise of Mr. Cadbury himself; and this proved the inspiration for him to write Charlie and the Chocolate Factory, and include references to chocolate in other books. His first job of selling kerosene in Midsomer Norton and surrounding villages in Somerset, south West England is also a subject in Boy: Tales of Childhood. After finishing his schooling, he went hiking through Newfoundland with the Public Schools’ Exploring Society (BSES Expeditions). and in July 1934, joined the Shell Petroleum Company, & after two years of training, he was transferred to first Mombasa, Kenya, then to Dar-es-Salaam, Tanzania. In August 1939, as World War II loomed, plans were made to round up the hundreds of Germans in Dar-es-Salaam. Dahl was made an officer in the King’s African Rifles, commanding a platoon of Askaris, indigenous troops serving in the colonial army. In November 1939, Dahl joined the Royal Air Force as an Aircraftman and was promoted to Leading Aircraftman on 24 August 1940. Following six months’ training on Hawker Harts, Dahl was made an Acting Pilot Officer. He was assigned to No. 80 Squadron RAF flying obsolete Gloster Gladiator biplanes, but did not receive any specialised training in aerial combat, or in flying Gladiators. Sadly during one mission, he was forced to attempt a landing in the desert because he was running low on fuel and night was approaching, unfortunately the undercarriage hit a boulder causing the aircraft to crash, fracturing his skull, smashing his nose and temporarily blinding him. luckily He managed to drag himself away from the blazing wreckage and passed out and was rescued and taken to a first-aid post in Mersa Matruh, then taken by train to the Royal Navy hospital in Alexandria. After his recovery, Dahl took part in the “Battle of Athens”,On 20 April 1941, alongside the highest-scoring British Commonwealth ace of World War II, Pat Pattle. Dahl was promoted to Flight Lieutenant in August 1942. During the war, Forester worked for the British Information Service and was writing propaganda for the Allied cause, mainly for American consumption. This work introduced Dahl to espionage and the activities of the Canadian spymaster William Stephenson, During the war, Dahl supplied intelligence from Washington to Stephenson and his organisation known as British Security Coordination, which was part of MI6, where he worked with other well-known officers such as Ian Fleming and David Ogilvy. Upon the war’s conclusion, Dahl held the rank of a temporary Wing Commander (substantive Flight Lieutenant)in August 1946 he was invalided out of the RAF. He left the service with the substantive rank of Squadron Leader. His record of at least five aerial victories, qualifying him as a flying ace. After the war Dahl went on to become one of the world’s best-selling authors, writing works for both children and adults and has been referred to as “one of the greatest storytellers for children of the 20th century”. In 2008 The Times placed Dahl 16th on its list of “The 50 greatest British writers since 1945”. His short stories are known for their unexpected endings, and his children’s books for their unsentimental, often very dark humour. Some of his notable works include James and the Giant Peach, Charlie and the Chocolate Factory, Matilda, The Witches, Fantastic Mr Fox, The Twits, George’s Marvellous Medicine and The BFG. In the 1986 New Years Honours List, Dahl was offered the Order of the British Empire (OBE), but turned it down, purportedly because he wanted a knighthood so that his wife would be Lady Dahl. Dahl is the father of author Tessa Dahl and grandfather of author, cookbook writer and former model Sophie Dahl (after whom Sophie in The BFG is named). sadly Dahl passed away on 23rd November 1990 at the age of 74 of a blood disease, myelodysplastic syndrome, in Oxford, and was buried in the cemetery at St Peter and St Paul’s Church in Great Missenden, Buckinghamshire, England. Best known for his wonderfully outlandish illustrations of all sorts of wierd & wonderful contraptions, the English cartoonist W. Heath Robinson, sadly passed away on 13th September 1944. In the UK, the term “Heath Robinson” has entered the language as a description of any unnecessarily complex and implausible contraption, similar to “Rube Goldberg” in the U.S.